Maya’s new friend Bailey loves to talk, and everything—including everyone—is fair game. But when Bailey gives hurtful advice, shares others’ information, and spreads harmful rumors, Maya realizes that Bailey is not the kind of friend she needs. And Bailey learns that, in her efforts to establish connection and gain attention, “trouble talk” doesn’t win her lasting friendships. 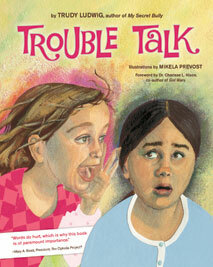 With engaging illustrations that poignantly capture the emotions of the characters, Trouble Talk® helps young readers understand how to fit in, whom to trust, and how to make friends. Included in this picture book are discussion questions, tips for turning trouble talk into healthy talk and additional resources for adults and children.